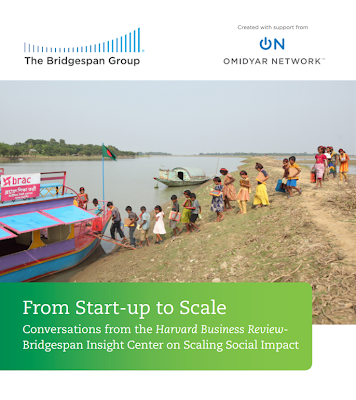 I woke up to a wonderful email from Bridgespan Consulting letting me know that my Harvard Business Review Editorial - Big Impact on a Small Budget - has been selected to be a part of a Compendium titled, From Start-Up to Scale - Conversations About Scaling Social Impact. My editorial talks about how we built Ben's Friends on the cheap by enlisting volunteers who were passionate about helping patients and by using new techniques like "cloud computing" and "crowdfunding." It's really an honor to be a part of this book. You'll find my entry on page 45. I'd like to thank The Omidyar Network, a major foundation in the non profit and social impact world for sponsoring the book, Chris Addy (Bridgespan and a Kellogg Classmate) for making the original intro to HBR and to Kate Smith Milway for choosing my editorial and for making all this possible. Thanks.